"This talisman and this ring are not less valuable. They will enable you to discover all the treasures which exist and to ensure you the possession of them. Place the ring on the second finger of your right hand, enclose the talisman with the thumb and little finger of your left hand, and say, Onaim Perantes, Rasonastos. " I repeated these three words, and seven spirits of a bronze colour appeared, each carrying a large hide bag which they emptied at my feet. They contained gold coins which rolled in the middle of the hail where we were. I had not noticed that one of the spirits had on his shoulder a black bird, its head covered with a kind of hood. "It is this bird," the old man said to me, "who has made them find all this treasure. Do not think that these are some of what you have seen here. You can assure yourself of this." I replied, "You are for me the truth itself. My father! Do you believe that I would insult you by doubting?" He made a sign, and the spirits replaced the gold in the bags and disappeared. "You see, my son, what the virtues of these talismans and rings are. When you know them all, you will be able, without my aid, to perform such miracles as you judge proper. Replace in the casket those of which you have made proof, and take this one (Figure No. 6). 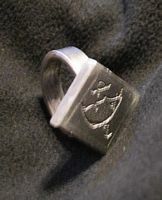 "They will enable you to discover the most hidden secrets; you will be able to penetrate everywhere without being seen, and not a single word in the universe can be uttered without it coming to your ears, whether you wish to listen to it yourself or to have it "This talisman and this ring are not less valuable. They will enable you to discover all the treasures which exist and to ensure you the possession of them. 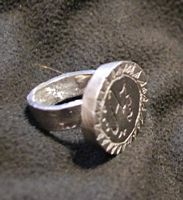 Place the ring on the second finger of your right hand, enclose the talisman with the thumb and little finger of your left hand, and say, Onaim, Perantes, Rasonastos." I repeated these three words, and seven spirits of a bronze colour appeared, each carrying a large hide bag which they emptied at my feet. They contained gold coins which rolled in the middle of the hail where we were. I had not noticed that one of the spirits had on his shoulder a black bird, its head covered with a kind of hood. "It is this bird," the old man said to me, "who has made them find all this treasure. Do not think that these are some of what you have seen here. You can assure yourself of this." I replied, "You are for me the truth itself. My father! Do you believe that I would insult you by doubting?" He made a sign, and the spirits replaced the gold in the bags and disappeared. "You see, my son, what the virtues of these talismans and rings are. When you know them all, you will be able, without my aid, to perform such miracles as you judge proper. The next day we followed the course of our mysterious operations. The spirit had not left us. "You see, my son," said the old man, "that everything becomes easy with confidence and a pure soul without stain." He opened the casket and took from it the talisman and ring (Figure No. 7). When he had placed them in my hands, he pronounced two words, which I will teach you. "Place this ring on the little finger of your left hand and the talisman to your right ear, and the most discreet man will divulge to you his most hidden thoughts. Here are the two words: Noctar, Raiban, and if you add a third word, which is Biranther, your greatest enemies will not be able to prevent themselves from loudly publishing their projects against you. In order to convince you, I am going to have appear before you one of the Beys of Cairo, and he will impart to you all of his schemes against the French." He then said "Nocdar," to the spirit who then vanished like lightening. A quarter of an hour after he returned with the Bey who said: "We have made a treaty of alliance with the English, and the armistice concluded with the French will be broken without warning." He disappeared with the spirit after the old man had said: "Zelander. The Mufti of the Grand Mosque will appear before your eyes and show you a manuscript of a work which he has composed and which he has refused to show to his best friends, even the Grand Visir." I did that which has previously been indicated, and very soon the Mufti appeared and placing his manuscript on the table, he said to me: "Tonas, Zugar," which means in the language of the magi: read and believe. The old man looked at him affectionately; he gave him his hand pronounced with sweetness and expression, o Solem. The Mufti, after bowing, disappeared. "It will serve to activate as many spirits as you wish to undertake or to stop operations which would be contrary to you. The magic words are: Zorami, Zaitux, Elastot. We will not at this moment make any experiments; tomorrow we will go to the shores of the Nile and we will have constructed a bridge of a single arch on which we shall pass to the other side of the river. 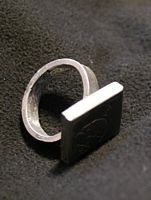 "Here is the next talisman and its ring (Figure No. 9). They have the property of destroying everything, of commanding the elements, of calling down the thunder, hail, the stars, earthquakes, hurricanes, water spouts on land and sea, and of preserving our friends from all accidents. Here are the words which one must pronounce (the numbers indicate each thing that you wish to operate): first, you pronounce: Ditau, Hurandos; second, Ridas, Talimol; third, Atrosis, Narpida; fourth, Uusur, Itar; fifth, Hispen, Tromador; sixth, Paranthes, Histanos. "The talisman and the ring (Figure No. 10) will make you invisible to all eyes, even those of the spirits. Only the Great Being could be witness to your steps and your actions. You will penetrate everywhere into the bosom of the seas, into the bowels of the earth, you can likewise survey the airs, and no action of men can be hidden from you. Say only : Benatir, Cararkau Dedos, Etinarmi. " I repeated these four words, and through the walls of the Pyramid I saw two Arabs who were on the plain and who were profiting by the obscurity to ransack a tomb where they hoped to find something of value. "You will be able, when you wish, to prove the other things which I will have taught you, it will only be necessary to place the ring successively on the different fingers of the right hand. 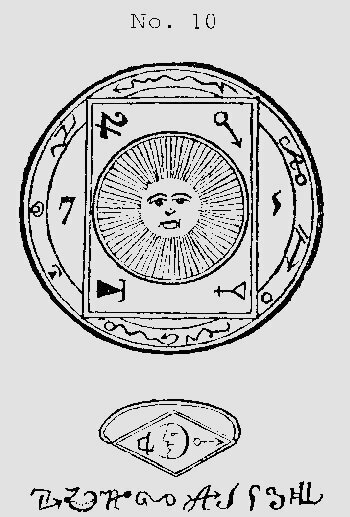 "The talisman and ring (Figure No. 11) will serve to transport you into whatever part of the world you judge appropriate without running any danger. Say merely these words: Raditus, Polastrien Terpandu, Ostrata, Pericatur, Ermas But I hope that you will not make use of these means to leave me without my consent. Promise it to me." "My father, I swear to it." "With the talisman and the ring (Figure No. 12) you will be able to open all locks, no matter what secrets have been employed to shut them; you will not need a key. Simply by touching them with the ring and pronouncing these three words: Saritap Pernisox Ottarim they will open of themselves without difficulty. Make proof of this on the spot, my son," the old man told me. "Close the casket which you see on that table." I did this, and after having assured myself that nothing could open it but the key, I touched it with the ring and pronounced the magic words, and it opened of its own accord. "It will be the same," added the old man, "with all the doors of prisons, fortified castles, where they might lock you up. "With the talisman and ring (Figure No. 13), you will be able to see what takes place in all houses without being obliged to enter them; you will be able to read the thoughts of everyone whom you approach and with whom you find yourself, and you will be able to render them service or do them injury as you wish. It will be sufficient to place the talisman on your head and then to blow on the ring saying: o Tarot Nizael, Estarnas, Tantarez these words are for knowing the thoughts of people. "In order to render service to those who deserve it, you say: Nista, Saper, Visnos and they will immediately enjoy all sorts of prosperities. "To punish the wicked and your enemies, you will say: Xatros, Nifer, Roxas, Rortos and they will at once suffer punishment and frightful torment. What you have already seen should prove to you that I have advanced nothing which cannot be realised; therefore it is useless to make proof thereof. 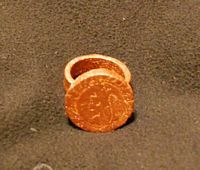 "The talisman and ring (Figure No. 15) have a property as extraordinary as agreeable; they will give you all the virtues, all the talents, and the inclination to do good by changing all substances which are of a bad quality and rendering them excellent. For the first object, while elevating the talisman and with the ring placed on the first joint of the third finger of the left hand, it is sufficient to pronounce these words: Turan, Estonos, Fuza "For the second operation you say: Vazotas, Testanar , and you will see operate the wonder which I have proclaimed to you. "The talisman and the ring (Figure No. 16) will assist you to know all the minerals and vegetables, their virtues and properties, and you will possess the universal medicine. There is no illness that you will not be able to cure and no cure that you will undertake without success. Aesculapius and Hippocrates will only be novices compared to you. You pronounce only these words: Reterrem, Salibat, Cratares Hisater, and when you are near a sick person you will carry thet talisman on the stomach and the ring with a St. Andrew’s Cross around your neck on a ribbon the colour of fire. 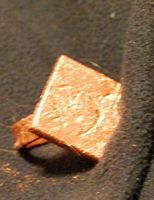 "The talisman and ring (Figure No. 18) will enable you to know the good or bad intentions of all the individuals whom you will meet to guarantee you of it and to impress on their face a mark which will be noticed by everyone. It is sufficient to pronounce these mysterious words, while placing the talisman on your heart and the ring on the little finger of your right hand. You will then say: Crostes, Furinot, Katipa, Garinos. "The talisman and the ring (Figure No. 19) will give you all talents and a profound understanding of all the arts so that you can perform with as much brilliance as the greatest masters and foremost artists. It is sufficient to carry the talisman and the ring in a manner you judge suitable while pronouncing these seven words: Ritas, Onalun, Tersorit, Ombas, Serpitas, Quitathar, Zamarath while adding afterwards the name of the art or the talent which you wish to possess. "The talisman and the ring (Figure No. 22) will serve you to recognise what the infernal powers wish to undertake, and you can abort all their projects by placing the talisman on your chest and the ring on the first joint of the little finger of the left hand. You pronounce these words: >Actatos, Catipta, Bejouran >Itapan >Marnutus >Composition of the Talismans and the Rings. 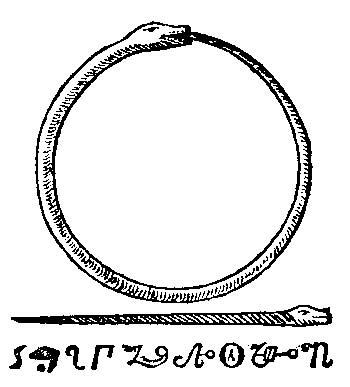 "As it is possible that you have not had the means of making talismans and rings similar to mine," the old man said to me, "you will make them up in the manner which I will indicate. Know that the rings are of bronzed steel with the characters engraved thereon. 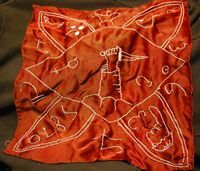 The talismans should be made of silk cloth in the dimensions of the figures.